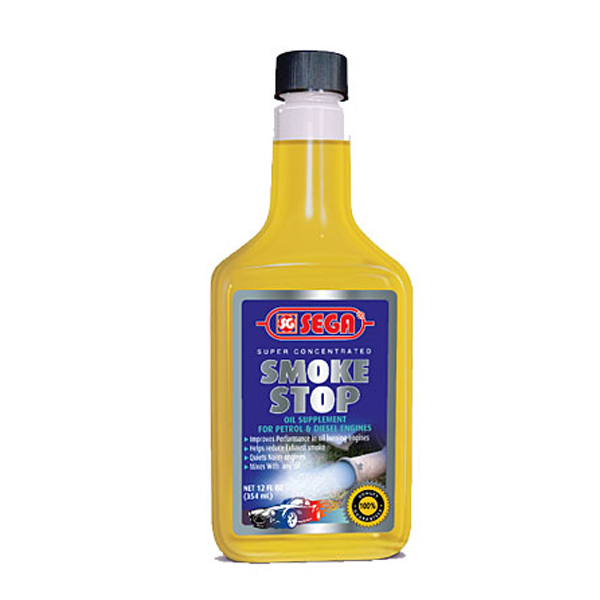 SEGA Stop smoke is an soluble supplement designed to reduce exhaust smoke due to oil burning. - Reduces exhaust smoke due to oil burning. - Improves the viscosity properies of the oil at high oil temperatures. - Seals the gaps between worn engine copponents. - Improves compression and engine performance. - Ensures a strong protective oil film under high temperature conditions. Add contents to the oil when engine is warm to obtain a good mixture with the oil after adding it, let the engine run or drive with the car for 4 minutes. 1 bottle of 325 ML treats 3-6 litres of engine oil. Se at oil change or between oil changes as needed. Allow the SEGA stop smoke to drain fully from the bottle. For petrol, LPG and diesel engines. or cars with excessive blue/grey exhaust smoke due to oil burning. Specially effective in older engines with worn components. an also be used as prevetive agent in case of heavy load and high temperature operation.